Add a Southwestern touch to your '14-Current Jeep Cherokee! 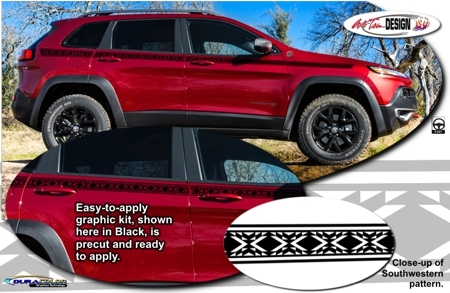 Available in four (4) print colors (Black shown), kit is precut - NO TRIMMING required - and is set to be placed along the Cherokee's upper body areas as shown. Graphic kit is vehicle specific and will fit any '14-Current Jeep Cherokee. They will not fit any other vehicle.